Growing up in the suburbs, we had shopping a plenty. And while, admittedly, I have never been a fashionista, shopping was somewhat of a hobby for me. Like most folks, getting a good deal just makes me smile. So when we moved to the country, it was one of those things in the back of my mind that I often wondered how I’d get my fix. Of course there is online shopping, and I do absolutely love shopping local in small town boutiques, but holy cow did I fall head over heels in love with Tractor Supply! For those of you who live in the city, Tractor Supply is a chain store that is absolutely essential to country life. It is definitely my wonderland of shopping. Not a huge store, but big enough for me to do some damage to the old wallet. In fact, Cowboy (my hubby), would prefer it if he could make the trips to Tractor Supply all on his own. As he puts it, “It’s much cheaper that way.” So what is the fascination? Well when you move to the country some things just simply change. For example, I love shoes, but in the country mud and dirt are just a part of life and a pair of rubber boots becomes a gal’s best friend. And where can you find pink ones? You guessed it, at Tractor Supply. And when you need just about anything to take care of your critters from food to wormer to medicines to feed buckets? Yep, Tractor Supply. I can go in there and just plain old wander around like a kid. I can often be found digging through the books and magazines sections looking at everything from how to raise chickens to how to tell your horse’s mood to how to bake the best cakes. If you’re in an extra girly mood, they have cute western shirts, T-shirts, and such for a quick pick-me up. And if you really want to see a country girl go nuts? Try to pick out horse buckets, brushes, halters and such in your favorite colors. One of my all-time favorite gifts this Christmas? A purple muck rake (for my city friends – that’s what you use to clean up after the horses). So, there you have it. I still love to shop, but perusing aisles of clothes and shoes and jewelry is now replaced with bright colored horse buckets, fun western gifts, and just stuff you plain old NEED in the country. I don’t shop nearly as often as I used to when I lived in the suburbs, and honestly I don’t miss it. But when I need a little fix, I can run down to my local Tractor Supply and get all a gal needs for herself, her hubby, her critters, and her farm. Try those pink rubber boots on for size! 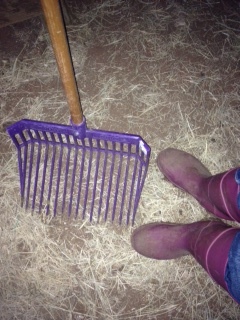 Essential farm girl needs – pink boots and a purple muck rake!